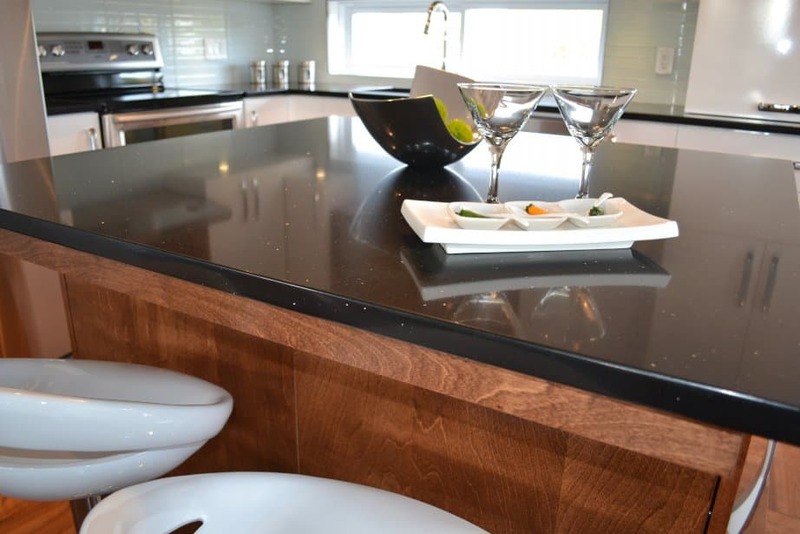 Among the multitude of materials for kitchen countertops, quartz is currently the most sought-after high-end products. Indeed, this contemporary design material offers the best quality / price ratio while having the qualities sought by the owners: durability, no maintenance and a wide choice of design. That said, granite countertops, concrete, wood or stainless steel can also be interesting choices depending on the use and design sought. Quartz countertops are manufactured from natural quartz crystals to which colors pigments are added. The whole is agglomerated in panel with about 3% of resin. Quartz panels thickness can range from 3/4 “to 1-1 / 4” (18 to 30mm). A quartz countertop can be up to 12 feet (3.5 m) long without any joints. However, we recommend a maximum length of 10 feet (3 m) to prevent breakage when handling the panel. We can make thin and colored joints that are almost unnoticeable and that match the panel color. Unlike granite and marble that needs to be polished regularly, the quartz countertop finish is permanent. Its surface is less porous than that of marble or granite and requires no annual sealing. As these panels are little porous, it is possible to choose light colors that will not be stained by wine, oils, food colors or acidic foods. The agglomerate of quartz crystals is antibacterial and does not release volatile organic compounds in the air. In normal residential use, it is simply cleaned with soapy water. In this sense, it can be affirmed that a quartz countertop does not require major maintenance and offers lasting beauty. Quartz panels in white shades remain the most popular, but they come in different appearances and colors. Quartz countertops can be uniform in color or imitate granite and marble. Being composed of very fine crystals, their finish is ultra-smooth and can be glossy or semi-glossy. As it is a homogeneous panel in its mass, we generally recommend it with “sub-plan” sinks where the quartz panel covers the edges of the sink. This greatly facilitates maintenance. It can also be used to create “tomb” type islets where the quartz panel is continuous on top and sides. Quartz panels are very hard, but like any countertop surface it should not be used as a cutting surface. Nothing resists a sharp knife. In addition, quartz chips do not reseal and any repair remains apparent. Also, hot cauldrons should not be put on the quartz because in this case, it can form permanent white circles. Despite our preference for the quartz, other countertop materials also have their interests whether for their design, cost or style. In a more rustic or traditional design, wooden or bamboo countertops are convivial. As they are more fragile with water and heat, they are mostly interesting for serving kitchen islands where there is no sink or cooking plate. Solid concrete countertops are less popular, but they can have a unique design. Stainless-steel coatings fit well with futuristic or industrial decorations. However, they are difficult to maintain in good condition. They scratch easily and fingerprints stain impregnate, making maintenance needed more regularly. Our design-build service is there to help you make the best choice based on usage, your requirements and your budget.